The primary personality characteristic that Mother Theresa is associated with is her philanthropy. And sure enough, this particular quality is etched on several parts of her hand. The more the number of signs pointing to a certain personality trait, the stronger the indication. channelize her strong will and energy into a productive cause (this is evident by the low-set of the thumb). She liked to be useful, and had a strong desire to make a difference. The placement of her thumb further reveals the ethical purpose behind the will. Her hand shows deep generosity and a desire for freedom, not just for herself, but for others. As if this is not enough to make a person great, she was open-minded and helpful. Money and fame meant far less to her. Check out a hand photograph of hers here. Her strong Mount of Venus and sweeping Heart Line confirm the love that was in her heart and the love she was able to give. It was in her very nature. Her thumb shows that this love was channelized to a great cause. An interesting aspect of Mother Theresa’s hand is that there is a distinct difference between her left and right hands. As she was right-handed, and her right hand shows what she actually was and the left hand reveals her inherited qualities. 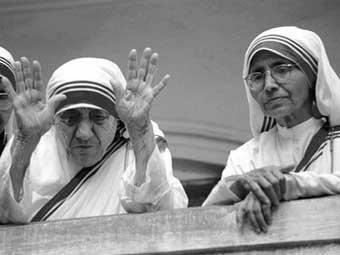 The change in the hand signifies that Mother was not born a saint. She became one by the dint of her own merit and effort, and the direction she chose. The thumb on her left hand is an average one and so is the placement of her heart line. The right hand shows more compassion and kindness. As to how and why people change, either to become greater than they are, or why they destroy their lives, is always something of a mystery. Perhaps Mother was motivated by her religiosity which was imbibed in her since childhood. However, her religiosity assumed a practical tinge as she grew older, with less belief in ideals and more of a determination to see results on the ground. 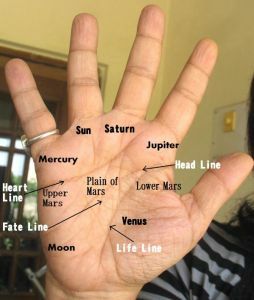 This is evident from the change in the shape of her Jupiter finger. The shape and placement of her fingers reveal that she was always a practical, action-oriented woman. Talking meant little to her and in fact she was not very articulate. She also did exactly what she wanted and in her early years probably found it difficult to see another point of view. As she grew older she became more amenable to other points of view and my reading is that this aspect must relate to her religiosity. She was no intellectual, but she was a street-smart lady, as is evident by the development of her Mercury Mount. This too is a trait that she developed over the years. Mother Theresa’s fingers also tell us that she was a straightforward and no-nonsense type of person. The setting of her Jupiter indicates that she was a little low in self-esteem. It shows humility as well, if other signs do not contradict it. To conclude one can say that Mother Theresa’s hands show her to be a practical down-to-earth person, a human being who thought of others before self. Read about other Spirituals Leaders from different parts of the world. Check out the hand analysis of Mahatma Gandhi or Pope Benedict XVI or Ayatollah Khomeini. Or maybe you would like to know the difference between Satya Sai Baba and Sai Baba of Shirdi. Nita, what I found interesting in your post is that personalities like Mother Theresa have similar character traits,e.g. a sense of humility,modesty, not concerned about wealth/fame,selflessness,a desire to serve mankind etc. The question that comes to mind is why are such people similar, why is the common person not like that? One can theorize about this, have different opinions etc.However, the fact remains that from time to time,such people (or saints) are born and do so much service to mankind, it's totally unbelievable.A few that come to mind are Swami Vivekananda,Sri.Ramakrishna,Mata Amritanandamayi, J.Krishnamurti (in a different way).Good post, thanks. Padmini, that's question that I have been mulling over too. The common traits that people in certain professsions have. When it comes to sainthood the selflessness needs to be there. I think this can happen when there is a great goal, or rather a strong motivation. In her case it was her true belief in religion (all believers are not selfless though so this needs more analysis. During the time of India's partition for example a lot of heroes were born and were made as well, and again it has to do with a great cause. If a cause catches a person's imagination and the innate unselfishness is also present, the person can reach great heights. Vishesh, she was certainly someone who inspired with her work. "As to how and why people change, either to become greater than they are, or why they destroy their lives, is always something of a mystery" ...in the course of exploring something profound and deep about the humankind and palmistry it self..u have raised a very important question..which unfortunately as observers we see but never in the deepest sense understand ....hate to be melodramatic about it...but this is a question that is intrigued me for the last 2 years and continues to intrigue me. i want to thank u for putting out this question. and let me be clear..of the fact that in gandhi's case i am only referring on his humble side...which he so evidently was..but it also point to his inner security..which he compensated...by his large and strong thumb and venus(also in case of einstein)...helping him to reach out to others...i hope i am not clarifying my self too much..ur thoughts..? and again..when referring to intelligence i am not referring to a intelligence of an intellectual kind,or acquiring a skill..which can too be increased but..really to be aware of all that is happening around and still managing to letting ur mind be free ..cause see most of us may have intelligence and good observation...but cannot let our selfish little pity selves not to intefere with our intelligence our to sum it up our real potential..i want ur thoughts on this..not only because i have come to realise this truth..but from the standpoint of what palmistry can do to make people realise their true potential themselves...i am sure ull agree with me and JK..call me fan or anything..but i wanted to get this point across...which i am still not sure if i have or not..but i tried..so please read through..
Atlantis, regarding your first question, I believe that intelligence and awareness grows if there are fewer insecurities in us. If we are insecure, anxious and self-absorbed our daily life is filled with petty troubles and worries and this stops us from fulfilling our true potential. Every individual is different (as to his potential) but the way of bringing out the best in a person is to be calm and compassionate, no doubt. Just notice the people around you who get hurt at the slightest insult...usually these people have large egoes and their life is spent in nursing them! How will they be able to concentrate on the power of their mind? As you said it is not just about intelligence, it is about being a better person and a happier person.